Barely before the ink was dry on our article about Samsung confirmation of existence of a Galaxy Note Pro and Galaxy Tab Pro, we already have details of the purported specifications of the four new devices. 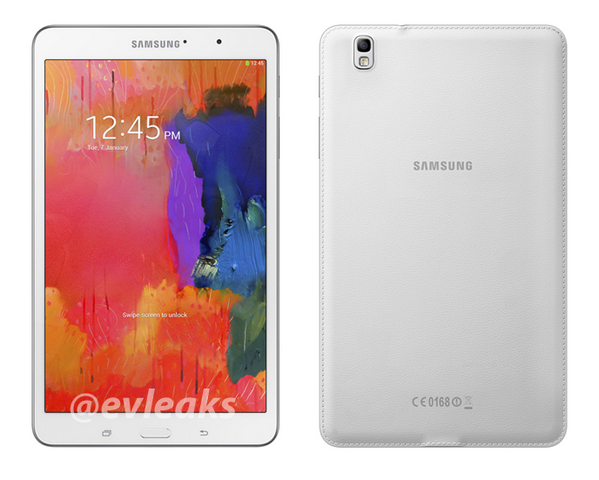 This includes a press image of the Galaxy Tab 8.4 Pro leaked by a source that is well known for correct rumours, EV Leaks. The image seems to borrow much from the Galaxy Note 3 which was the first to come wearing that leather look and feel in the rear. The camera also looks different from what we have experienced preciously in other Samsung tablets except the Galaxy Note 10.1 2014 which was unveiled same day as the Note 3 in Berlin at IFA. The physical home button and the capacitive touch controls on each side of it remain. What’s left not is for Samsung to confirm the above details and also list what comes on board in each of the four devices.